At the time the Great Plains were settled in the mid-1800s, the land was covered by prairie grass, which held moisture in the earth and kept most of the soil from blowing away even during dry spells. By the early 20th century, however, farmers had plowed under much of the grass to create fields. The U.S. entry into World War I in 1917 caused a great need for wheat, and farms began to push their fields to the limit, plowing under more and more grassland with the newly invented tractor. The plowing continued after the war, when the introduction of even more powerful gasoline tractors sped up the process. During the 1920s, wheat production increased by 300 percent, causing a glut in the market by 1931. That year, a severe drought spread across the region. As crops died, wind began to carry dust from the over-plowed and over-grazed lands. The number of dust storms reported jumped from 14 in 1932 to 28 in 1933. The following year, the storms decreased in frequency but increased in intensity, culminating in the most severe storm yet in May 1934. Over a period of two days, high-level winds caught and carried some 350 million tons of silt all the way from the northern Great Plains to the eastern seaboard. According to The New York Times, dust “lodged itself in the eyes and throats of weeping and coughing New Yorkers,” and even ships some 300 miles offshore saw dust collect on their decks. The dust storms forced thousands of families from Texas, Arkansas, Oklahoma, Colorado, Kansas and New Mexico to uproot and migrate to California, where they were derisively known as “Okies”–no matter which state they were from. These transplants found life out West not much easier than what they had left, as work was scarce and pay meager during the worst years of the Great Depression. 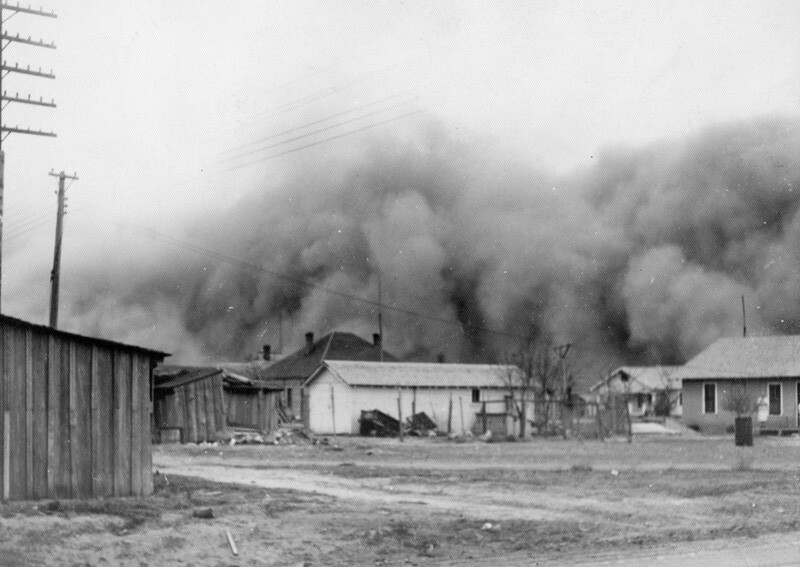 Another massive storm on April 15, 1935–known as “Black Sunday”–brought even more attention to the desperate situation in the Great Plains region, which reporter Robert Geiger called the “Dust Bowl.” That year, as part of its New Deal program, President Franklin D. Roosevelt’s administration began to enforce federal regulation of farming methods, including crop rotation, grass-seeding and new plowing methods. This worked to a point, reducing dust storms by up to 65 percent, but only the end of the drought in the fall of 1939 would truly bring relief.